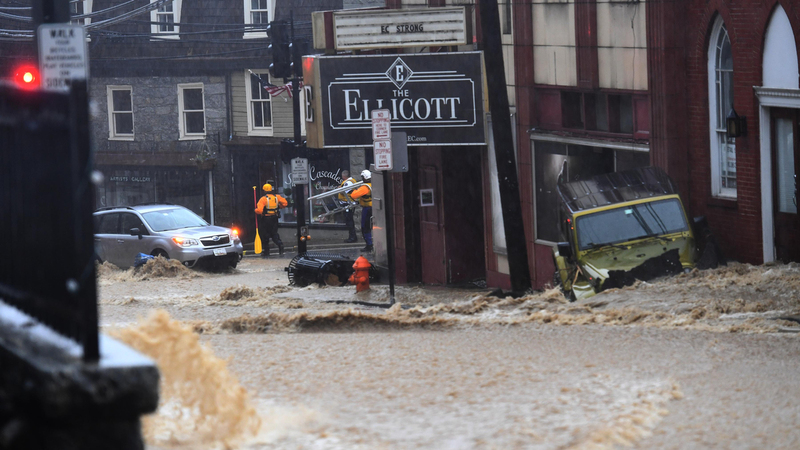 Ellicott City, Md., Suffers Flash Flood, Ravaging Main Street; 1 Man Missing : The Two-Way Less than two years after what had been called a "once in a 1,000 years" flood in 2016, Ellicott City, Md., sees its historic downtown ravaged anew. One man remains missing. Ellicott City, Md. 's Main Street was turned into a raging river on Sunday, in a catastrophe that followed another flash flood in 2016. The water wrecked storefronts and left cars strewn amid debris on Monday. Fast-moving flood waters caused mayhem in Ellicott City, Md., on Sunday, triggering an emergency declaration and urgent messages for residents to seek higher ground. One man remains missing, as crews work to clear the area. Howard County Police say Eddison Hermond, 39, of Severn, Md., is unaccounted for; they're asking the public to help find him. Washington-area radio news outlet WTOP describes Hermond as "an Air Force veteran and a member of the National Guard." A friend of Hermond's told WTOP that the veteran had been in a restaurant in downtown Ellicott City on Sunday; witnesses said he was swept away after trying to help people. Swiftwater rescue teams searched for Hermond last night, both on foot and in all-terrain vehicles – but the search was suspended and resumed on Monday, according to the Arbutus Volunteer Fire Department. Intense flooding hit the town's Main Street in at least two waves on Sunday, shoving cars down the street and bursting through storefronts – including at several buildings where people found themselves suddenly trapped in stores and restaurants. Images and video from the scene are striking, showing fast-moving water rising nearly as high as the bottom edge of the streets' stop signs and obliterating anything in the torrent's path. For many, it was a replay of the summer of 2016, when the same area suffered massive damage from a flash flood. "It started out as [water] pooled around the sides of the road, a couple inches deep on the curb. Then it covered the road. Once it came over the curb, we brought all the customers up to the second floor. Then it got bad from there. The water ended up being six, seven, eight feet deep, coming down Main Street." It took Hemmis a lot of work — and new plumbing and equipment — to reopen six months after the 2016 flood. Nearly all of the restaurant's employees managed to return after that catastrophe. But Hemmis said he's uncertain whether he can reopen. "I'm really not sure where I'm at with that," he said. For now, he said, he's just trying to make sure his employees can find work and pay their bills. Founded in 1772, Ellicott City's Main Street and downtown have been designated a historic district. After the 2016 flood, the city barely avoided having to tear down any buildings in a long and expensive rebuilding effort. In that catastrophe two years ago, two people died in what was called a "once in a 1,000 years" event. But in 2018, it has happened again, devastating an area that, due to its valley setting, had endured other floods in the past. Rain storms in the area have been growing more intense in recent years, according to an expert who also says the flooding is linked to how the area's land surface has changed. "It's heavily paved, there's lots of narrow streets that act as very rapid conduits of water – so the flood was as much about the nature of the underlying land surface as it was the large amount of rain falling from the sky." One day after the recent flash flood, people have been reaching out to help. The Howard County government says anyone who wants to volunteer can register at its website – but that for now, the downtown area remains largely off-limits. The Visit Ellicott City organization says a local non-profit called the Ellicott City Partnership is taking donations to help the community recover from the flood, as it did in 2016. On Monday, conditions had dried out enough that salvage crews could begin towing vehicles that had been caught in the disaster. Residents and business owners have been unable to visit Main Street. Access won't be granted until Tuesday, Howard County said on Monday. People who have presented an ID or utility bill will be escorted into the area for 10 minutes at a time. "We are heartbroken to see the devastation that occurred yesterday in Ellicott City, and the serious flooding in multiple jurisdictions across our state" Gov. Larry Hogan said.